The SISIS Dart is an independently powered vertical action aerator ideal for sports field maintenance as well as grass lawns and amenities. Extremely well suited for the maintenance of cricket squares as a cricket aerator. Aeration is crucial for improving drainage, reducing turf compacting, thatch build up and increasing the health of lawns and the Dart is an ideal tool for outstanding turf and lawn treatment. The SISIS Dart is an independently powered vertical action aerator ideal for sports field maintenance as well as grass lawns and amenities. Ideal for golf course maintenance. 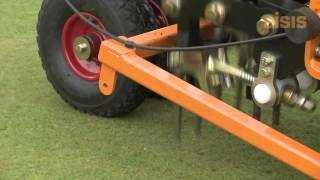 A demonstration of the Sisis Dart - an ideal tool for bowling green maintenance, tennis court maintenance and croquet lawn maintenance. It's extremely well suited as a bowling green aerator. 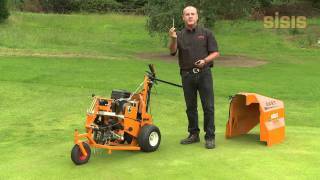 A demonstration of the Sisis Dart - an ideal tool for fine turf maintenance. The SISIS Dart is an independently powered vertical action aerator ideal for sports field maintenance as well as grass lawns and fine turf.